We’ve recommended the following Sous Vide machines based on reviews and consumer popularity. We’ve also researched features and specifications for each cooking machine so you can choose which Sous Vide is best for you. If you’re interested in buying a sous vide cooker, then you’ve come to the right place. We’ve listed the top sous vide machines and compared the best prices from online retailers. You might first be wondering, what exactly is a sous vide and how does it work? Sous vide is a method of cooking that involves preparing food in pouches, submerged in water that’s held at a precisely controlled temperature. To use a sous vide machine, just fill a pot with water, set the desired temperature and time, and cook everything (meat, souffle, carrots) to perfection. You can achieve restaurant quality meals by preparing your food at a constant temperature and not ever having to worry about over-cooking. Most sous vide machines also have a compatible app, so you can look up recipes and set your time and temperature all from your phone. See our list of sous vide machines below to find the best model, brand and price that’s right for you. The top-selling Anova Sous Vide is probably the most well-known cooking machine, with over 3,000 reviews on Amazon. To use the Anova, attach the tool to any water-filled pot, put your food in a ziplock bag and clip it to the side of the pot, then set your time and temperature on the device or the Anova app. 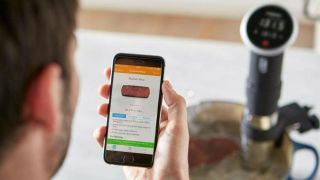 The app allows you to cook remotely, so you don’t have to stay in the kitchen waiting for your food to cook. The Anova app allows you to check on the water temperature, turn the sous vide machine off and will even send you notifications on your cooking status. You’ll also have access to over 1,000+ recipes as well as videos and guides for each recommended meal. The ChefSteps Joule stands out from other brands because it’s half the size of other sous vide machines and can conveniently fit in your kitchen drawer. Despite its size, the Joule is quite powerful, offering 1100 watts of power for ultra-fast water heating and the precisely desired temperature. The ChefSteps Joule is WiFi and Bluetooth enabled and includes the compatible Joule app. 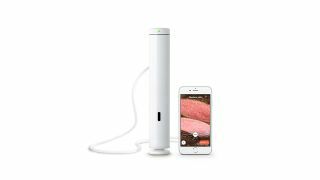 Unlike other Sous Vide machines, the Joule can only be controlled from the app and not manually on the device. The app features an exclusive “visual doneness” that allows you to see exact photos of how your food will turn out. 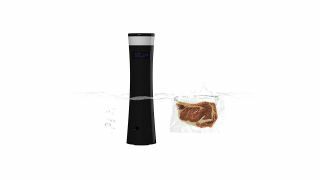 The Joule also works with Amazon Alexa so you can use your voice to control the sous vide. The Sansaire Sous-Vide started off as a Kickstarter campaign and exceeded its funding goal in just 13 hours. The Sansaire is unique from other sous vide machines because it can stand on its own in a pot or container of water without attaching to the side. This machine also doesn’t offer WiFi or Bluetooth connectivity. To set the time and temperature you’ll need to do so manually on the device. While the Sansaire lacks a compatible app, you can still cook nearly any food and achieve restaurant-like results. The LED screen displays the temperature, and the thermometer holds the water to within 0.1°C of the desired temperature. The Sansaire even claims to be used in some of the world’s best restaurants by professional chefs. Where can I buy other Sous Vide cookers? If you still need more information on the sous vide machine before you make your buying decision, we’ve answered some common questions below to help you out. Sous Vide is a French term that literally translates as “under vacuum.” This term makes sense because the method of sous vide is cooking food in a container that can be vacuum sealed in temperature controlled water. Because your food is prepared in a ziplock-like-container, it retains all its juices resulting in moist and tender meals. A sous vide machine uses a heated metal coil to warm water to a precise temperature with circulation. Once the sous vide machine is attached to any water-filled pot, you’ll set the desired time and temperature, clip your bag of food to the side of the pot and wait for the delicious results. Because you’re cooking at one constant temperature, a sous vide will take longer than preparing food on a grill or pan. The benefit of cooking your food at a constant temperature is that you’ll never have to worry about overcooking anything and everything is cooked evenly. What can a Sous Vide Cook? There are thousands of sous vide recipes with a variety of different foods that you can cook. When most people think of the sous vide they think of making the perfect steak, chicken, pork or salmon, but there’s more than just meat that the sous vide can perfect. You can prepare veggies and fruit, soft boiled eggs, rice or quinoa, and even bake cookies. The recipes are endless, and there are several cookbooks on Amazon that are just for the sous vide. If you’re interested in other cooking appliances check out our list of the best Instant Pot deals that are currently available.